HUS and thrombotic thrombocytopenic purpura (TTP) are within the spectrum of diseases seen with thrombotic microangiopathies (TMA). Recent advances in the understanding of the complement cascade have led to the discovery of the atypical HUS syndromes that also exist within this spectrum.A recent article in the American Journal of Kidney Diseases reviews the role of eculizumab in the treatment of aHUS and TMAs.Corresponding author Dr. Jan Schmidtko (JS) discusses this topic with Dr. Magdalena Madero (eAJKD), eAJKD Contributor. 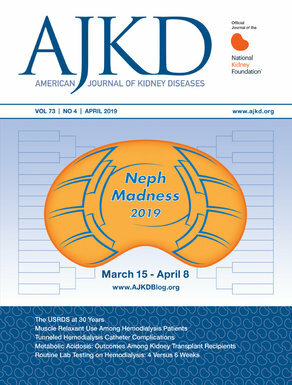 eAJKD: What are your current recommendations for treatment of aHUS? JS: Our increased understanding of the mechanism of disease in aHUS combined with the availability of a potent complement inhibitor has dramatically changed the treatment for our patients with aHUS. The ability of eculizumab to inhibit complement-mediated TMA, prevent resulting organ damage, and significantly improve kidney function may suggest it as a first line treatment in patients with aHUS. As an example, the adult patient with no prior history of TMA who presents to the hospital with concern for aHUS and laboratory tests ongoing for anti-factor H antibodies, complement studies, and ADAMTS13 activity, should be treated rapidly with eculizumab. In that case, we would recommend for patients older than 18 years of age 900 mg IV weekly for 4 weeks, then 1200 mg IV as the fifth dose, followed by 1200 mg IV biweekly. For patients younger than 18 years of age, smaller than 40 kg, or receiving intermittent fresh frozen plasma infusions, the doses have to be adapted according to prescribing information. The situation is less clear when the patient has known anti-factor H or I antibodies, since immunosuppression targeting antibody production via B-cell suppression (i.e., rituximab) might be equally effective. Nevertheless, the multicenter studies with eculizumab have shown no difference in efficacy of treatment with eculizumab or rituximab, independent of the antibody status. It seems likely we can treat the patient with antibodies against factor H and I equally well with eculizumab. eAJKD: What if eculizumab is not available within 24 hours? JS: If eculizumab is not available within 24 hours, daily plasmapheresis with fresh frozen plasma replacement should be undertaken. We recommend 5 sessions (1 session per day for 5 consecutive days), which should give ample time to obtain all laboratory results for further treatment decisions and/or initiation of eculizumab. A detailed medical history should exclude patients who are (to today’s knowledge) not eligible for eculizumab and who have TMA due to e.g. drug-therapy (e.g., gemcitabine), pregnancy or post-partum and streptococcal infection. In the future, we certainly have to gain more experience in these particular patient populations. eAJKD: What are the benefits of rapid use of eculizumab in aHUS? JS: Several data sources demonstrate that eculizumab should be used rapidly in any patient with aHUS. Case reports, clinical trials, and a recent review from colleagues in France show that earlier initiation of eculizumab is associated with improvement in kidney function. We know that plasma exchange does not provide significant clinical benefit in the majority of aHUS patients, and is also associated with significant safety concerns, volume overload, and high costs. Therefore, the evidence supports the need for rapid diagnosis of aHUS and prompt initiation of eculizumab. eAJKD: What is the role of eculizumab in O157:H7-positive STEC-HUS cases (the most common form of HUS)? Based on the ongoing trials, do you anticipate that eculizumab will become first line treatment for all types of HUS in the next few years? JS: We probably have to await the results of the large multicenter studies following the outbreak of STEC-HUS in Germany and other countries. Data from the German experience were presented at Kidney Week in 2011 and 2012, with ongoing work to establish a control group from within this outbreak to help interpret the results of eculizumab treatment in this setting. There are several case reports published of eculizumab use in patients with severe O157:H7 infection which suggest good outcomes. Personally, with current knowledge, I do not anticipate that eculizumab will become first line treatment in all types of “classical” HUS, but will have its place for the severe cases. Large population analysis and prospective trials will definitely teach us more. eAJKD: Are there potential side effects from eculizumab other than infectious complications? JS: As the terminal complement complex participates in the clearance of immune complexes, as in systemic lupus erythematosus, the use of eculizumab in those immune complex mediated diseases might aggravate or prolong ongoing disease activity. However, there is no hard data to support that. We should stay vigilant and gather cases of special and unique circumstances to learn from those particular patients and advance our understanding for future cases. More objectively, there is now 10 years worth of experience with eculizumab in patients with paroxysmal nocturnal hemoglobinuria, as well as the increasing experience in aHUS. The important safety consideration is and will be the increased risk of infection with encapsulated bacteria, such as meningococcal infection, which necessitates meningococcal vaccination in all patients starting eculizumab. Depending on the clinical context, prophylactic antibiotic therapy might be warranted. Beyond that consideration, there have not been increased rates of other infections observed, including those aHUS patients who have previously received a kidney transplant and hence are immunocompromised. Other reported adverse events were generally mild to moderate in nature, and eculizumab appears to be very well tolerated long-term. thanks for the update. I have a son with this disease and he has a new kidney with Eculizumab since two years ago. He is fine. As long-time member of The Foundation for Children with Atypical HUS and parent of a child with aHUS, I can attested to the overwhelming improvement in my son’s life. This drug is a game changer. Until there is a cure, this is our best hope for maintaining health. I thank all researchers who have worked on this puzzle, every bit of information you uncovered was another piece of the puzzle, helping to complete the picture, every fact you now gather will help future generations and perhaps lead to the elusive cure. Thanks to the medical journals and authors of all these articles also, for spreading the news, you are touching many lives. As also a member of The Foundation for Children with Atypical HUS, my son was diagnosed in 1993. He lost his kidney function at the age of 4, and has been doing dialysis ever since. He started eculizumab this month, and we are so grateful that this is now available. This is his miracle that he has been waiting almost 20 years for. Thank you for your diligent efforts to bring this to people who are searching for answers.